The Flaming Lips have been together since 1983, producing cutting edge music that has encompassed fuzzed out noise pop, experimental rock, and joyfully creative psychedelic pop. Their latest, Yoshimi Battles the Pink Robots falls into the latter category: gorgeously crafted pop tunes with moving melodies set to inspired bass lines and clunky, irreverent rhythms, buzzing and blurping analog synths, strumming acoustic guitars, and sweeping washes of symphonic sound. Pretty much every track is a stand out, from One More Robot/Sympathy 3000-21, a song about a robot learning to feel emotions, to the sweepingly majestic In the Morning of the Magicians, with its Neil Young like vocals, to the melancholy reverie of It's Summertime. One of the best songs is the title track, a slice of wonderful folk pop set to a very eccentric electronic rhythm. I was strangely caught up in the tale of Yoshimi, as she works out to prepare herself for her battle against the Pink Robots. Part 2 of the title track is one of two instrumentals on the album, a jazzy, almost progressive jam with The Boredom's Yoshimi P-we providing spirited shrieks and howls. The other instrumental, Approaching Pavonis Mons by Baloon, closes the album in glorious, sunset style, conjuring up visions of a fabulous Hugo Gernsback-like past future world. 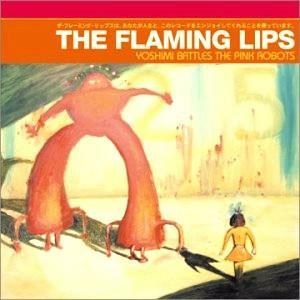 Yoshimi Battles the Pink Robots is a delightful trip: sad, funny, touching, thoughtful, and a pure joy to listen to. You can visit The Flaming Lips at their web site: http://www.flaminglips.com.